You must pilot a spaceship (saucer) through space in search for a planet that can support human life. This unknown world is called, Planet X. 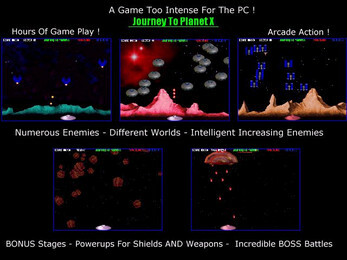 Journey To Planet X (JTPX) is an intense action game. There are over 20 different levels of play, including BONUS stages. 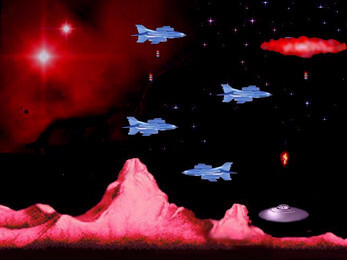 On the BONUS stages, you must blast asteroids as they pass by. Once in awhile an asteroid will release a power-up. The power-up will either be for shields or weapons. Try to gather as many power-ups as possible. There are also incredible BOSS battles and more. You must pilot a spaceship (saucer) through space in search for a planet that can support human life. This unknown world is called, Planet X. 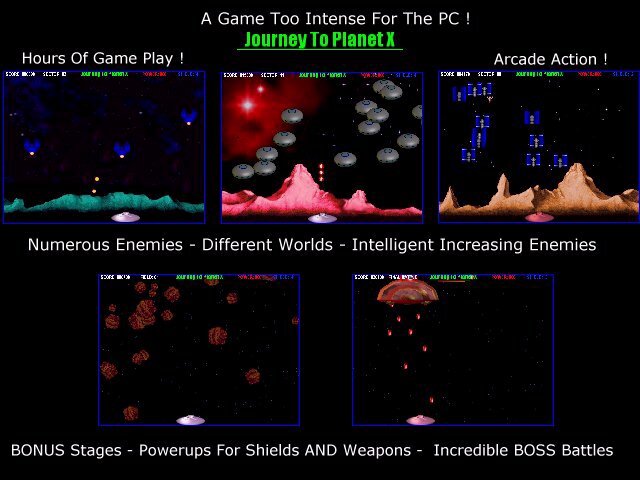 Journey To Planet X (JTPX) is an intense action game. There are over 20 different levels of play, including BONUS stages. On the BONUS stages, you must blast asteroids as they pass by. Once in awhile an asteroid will release a power-up. The power-up will either be for shields or weapons. Try to gather as many power-ups as possible. There are also incredible BOSS battles and more.